:Most interesting part is what was left unsaid: when will the queues outside banks and restrictions on cash draw also from banks abate? Underscored demonetization as moral cleansing of society: shuddi yagna. Declared victory over the parallel economy. Implied that those with incomes of over 10 lakh per annum are dishonest unless established otherwise. Subsidies announced for vulnerable sections as a reward for the pain without any indications of budgetary allocations. Reminded of the first part of budget speeches of state finance ministers, at least that of Kerala. Sounded like a pre (UP) election speech – at great cost to the national exchequer. New Delhi: Prime Minister of India Narendra Modi today on New Year’s eve urged all parties and leaders to move away from a “holier than thou approach,” to come together in prioritising transparency, and take firm steps to free politics of black money and corruption. A day after launching the BHIM app, Modi BHIM stands for Bharat Interface for Money. I call upon the youth, the trading community, and farmers to connect with BHIM as much as possible. Friends, the developments, decisions, and policies that were put in place after Diwali, will of course be evaluated by economists. 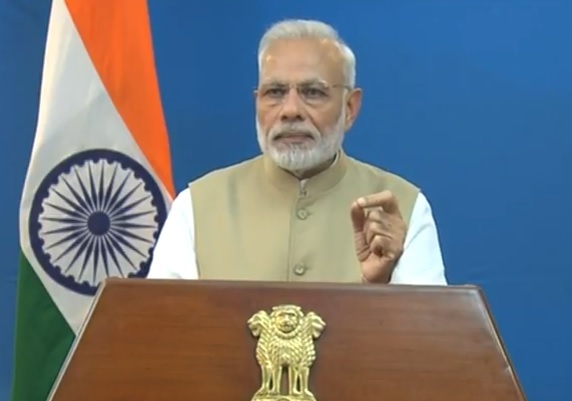 The PM said In this fight against corruption and black money, it is natural to debate the fate of the dishonest. What punishment will they get? The Law will take its own course, with its full force. But the priority of the Government now is how to help the honest, protect them, and ease their difficulty.How can honesty gain more prestige? In a few hours, we will be ushering in the new year of 2017. 125 crore Indians will join the rest of the world, in welcoming it with new hope, new energy and new dreams. Since Diwali, our nation has been witness to a historic rite of purification. The patience, discipline, and resolve displayed by 125 crore Indians, will play a critical role in shaping the future of the nation for years to come. In God’s creation, humans are endowed with fundamental goodness. With time, the distortions of badness creep in. People feel suffocated in a bad environment, and struggle to come out of it. Corruption, black money, and counterfeit notes had become so rampant in India’s social fabric, that even honest people were brought to their knees. knowingly or un – knowingly, intentionally or un- intentionally, had become a part of our daily lives. Developments post-Diwali have shown, that crores of Indians were looking for an escape from this suffocation. We have, during the external aggressions, of 1962, 1965, 1971 and Kargil; witnessed the intrinsic strength of our citizens. Such collective energy and patriotism is under- standable, in the face of external threats.However, when crores of Indians unite to fight a war against internal evils, it is unparalleled. Indians have, with firm resolve and infinite patience, faced difficulties with a smile, re-defining the concept of sacrifice. We have lived these ideals. 125 crore Indians have shown, in their fortitude, the importance we place in truth and goodness. This has been written on the sands of time. Indians have displayed the strength of people power, utmost discipline, and the ability to discern the truth in a storm of disinformation. They have shown that resolute honesty, can defeat dishonesty. They have shown how much, even people trapped in poverty, are willing to do, to build a glorious India. The people, through persistence, sweat and toil, have demonstrated to the world, an unparalleled example of citizen sacrifice, for the brighter future of a nation. Usually, when people’s movements have arisen, the people and the government have been at loggerheads. It is historic, that both the people and the government are on the same side in this battle against evil. The Government is well aware, that in this period, you had to queue up, and face difficulty in withdrawing your own money. I received letters from many people. They have shared their pain and sorrow with me, but also emphasized their support. You have talked to me as one of your own. In this fight against corruption and black money, it is clear that you wish to walk shoulder to shoulder with us. For us in Government, this is a blessing. My effort is to take the banking system to normalcy as fast as possible in the new year. I have asked all concerned officers in the Government to focus their attention to this task. They have especially been told to proactively resolve the problems in rural and remote areas. There is no precedent globally, to what India has done. Nations similar to us do not have the amount of currency that we had. Over the last ten to twelve years, 500 and 1000 rupee currency notes were used less for legitimate transactions, and more for a parallel economy. The excess of cash was fuelling inflation and black-marketing. It was denying the poor, their due. Lack of cash causes difficulty, but excess of cash is even more troublesome. Our aim is to achieve a balance. Economists agree that when cash is outside the formal economy, it is a cause of worry.When it joins the mainstream, it is an opportunity for development. I am sure, if great sons of India like Jayaprakash Narayan, Lal Bahadur Shastri, Ram Manohar Lohia, and Kamaraj had been present today, they would have applauded the patience, discipline and resolve of our countrymen. In the past few weeks, there have been many gratifying instances – it would take weeks to list them. It is a healthy trend for any nation, when the people wish to join the mainstream abiding by the law, and helping the Government in serving the poor. How long will we overlook facts that stare us in the face? I wish to share some information with you, which will either make you laugh, or make you angry. According to information with the Government, there are only 24 lakh people in India who accept that their annual income is more than 10 lakh rupees. Can we digest this? Look at the big bungalows and big cars around you. If we look at any big city, it would have lakhs of people with annual income of more than 10 lakh. Do you not feel, that for the good of the country, this movement for honesty, needs to be further strengthened? In this fight against corruption and black money, it is natural to debate the fate of the dishonest. What punishment will they get? The Law will take its own course, with its full force. But the priority of the Government now is how to help the honest, protect them, and ease their difficulty.How can honesty gain more prestige? This Government is a friend of good people. And it aims to build an enabling environment for the dishonest to return to the path of goodness. It is also a bitter truth, that people have complaints of bad experiences at the hands of Government machinery, and some government officers. This reality cannot be wished away. No one can deny that Government officers have a greater responsibility than common citizens. Therefore, it is the responsibility of all of us in Government, at central, state and local levels, to protect the common man, help the honest, and isolate the dishonest. Friends, It is accepted the world over, that terrorism, Naxalism, Maoism, counterfeit currency trade, drug trade, human trafficking – all of these depend on black money. These evils have become a festering sore on society and Governments. Demonetistion has dealt a severe blow to these trades. Today, youth who had turned to the wrong path, are returning to the mainstream in large numbers. If we remain vigilant, we can now save our children from returning to those evil ways of violence and cruelty. The fact that so much of the cash in circulation has been deposited in the banking system indicates the success of this mission. Events of the last few days indicate that escape routes for the dishonest have all been sealed. Technology has played a big role. The habitual offenders will be forced to abandon their misdeeds and join the mainstream. Friends, This also represents a golden opportunity for the country’s banking system. During this period, bank employees have worked day and night. Female employees too, worked till late hours as part of this mission. Post office staff, banking correspondents- all did exceptional work. Amid this herculean effort, some grave crimes by some officers in some banks have come to light. Some Government officers have also committed serious offences, and tried to take advantage of the situation. They will not be spared. At this historic juncture, I wish to make an appeal to the banks. History is witness that the Indian banking system has never received such a large amount of money, in such a short time. While respecting the autonomy of the banks, I appeal to them to move beyond their traditional priorities, and keep the poor, the lower middle class, and the middle class at the focus of their activities. India is celebrating the centenary of Pandit Deendayal Upadhyay as Garib Kalyan Varsh. Banks should also not let this opportunity slip. They should take appropriate decisions in public interest promptly. When policies and programmes are made with clear objectives in mind, not only are beneficiaries empowered, but both short term, and long term benefits are achieved. Spending is carefully scrutinized, and chances of good results are maximized. The more the villages, the poor, the farmers, the dalits, the tribals, the marginalized, the oppressed, the deprived and women are empowered, and financially enabled to stand on their own feet, the stronger the country will become, and the faster will be the pace of development. Friends, to further the principle of Sabka Saath – Sabka Vikaas, on the eve of the new year, Government is bringing some new programmes for the people. Even so many years after independence, millions of poor do not have their own home. When black money increased in our economy, houses became out of reach of even the middle class. The Government has taken some major decisions to ensure homes for the poor, the neo middle class and the middle class. Two new middle income categories have been created under the Pradhan Mantri Awaas Yojana in urban areas. Loans of up to 9 lakh rupees taken in 2017, will receive interest subvention of 4 per cent. Loans of up to 12 lakh rupees taken in 2017, will receive interest subvention of 3 per cent. The number of houses being built for the poor, under the Pradhan Mantri Awaas Yojana in rural areas, is being increased by 33 per cent. In addition to this, another scheme is being put in place for the neo middle and middle class in rural areas. Loans of up to 2 lakh rupees taken in 2017, for new housing, or extension of housing in rural areas, will receive an interest subvention of 3 per cent. Friends in the last few weeks, an impression was sought to be created that the agriculture sector has been destroyed. Farmers themselves have given a fitting reply to those who were doing so. Rabi sowing is up by 6 per cent compared to last year. Fertilizer offtake is up by 9 per cent. During this period, the Government has taken care to ensure that farmers do not suffer for want of access to seeds, fertilisers and credit. Now, we have taken some more decisions in the interest of farmers. Farmers who have taken loans for the Rabi crop from District Cooperative Central Banks and Primary Societies, will not have to pay interest on such loans for a period of 60 days. Farmers who have paid interest during the last two months, will receive these amounts back, directly into their bank accounts. Arrangements are being made to provide farmers even better access to loans from cooperative banks and societies. NABARD created a fund of 21,000 crore rupees last month. Now, Government is adding 20,000 crore rupees more to this. The loss that NABARD suffers by giving loans to cooperative banks and societies at low interest rates, shall be borne by the Government of India. The Government has decided, that 3 crore farmers who have Kisan Credit Cards, will be given RuPay debit cards within three months. Kisan Credit Cards were launched in 1998, but so far, it was essential to go to a bank, to use them. Now, farmers will have RuPay Debit Cards, which they can use anywhere. Just as agriculture is vital for the economy, so are the medium and small scale enterprises also called the MSME . Government has taken some decisions in the interest of small and medium businesses, which will also boost employment. Government of India underwrites loans given by banks to small businesses through a trust. So far, loans were covered upto one crore rupees. This limit is now being enhanced to 2 crore rupees. Earlier the scheme only covered bank loans. Hereafter it will cover loans given by NBFCs as well. This decision will enable better access to credit for small shop-owners and small enterprises. Banks and NBFCs will not levy high interest on these loans, as Government of India is bearing the cost of underwriting them. Banks have also been asked to increase working capital loans from 20 per cent of turnover to 30 per cent, for enterprises that transact digitally. Many people connected with this sector have made cash deposits in the last few weeks. Banks have been asked to take this into account when deciding on working capital. A few days back, Government announced a major tax relief for small businesses. Income of businesses with turnover of up to Rs 2 crores was calculated at 8% of the turnover. Now, for such businesses income from digital transactions will be calculated at 6%. This will effectively reduce their tax liability by 25%. The progress of the MUDRA Yojana has been very encouraging. Last year, nearly 3 and a half crore people have benefited from this. The Government now aims to double this, giving priority to Dalits, Tribals, Backward Classes and Women. A new scheme is being launched for pregnant women. We are introducing a nation-wide scheme for financial assistance to pregnant women. 6000 rupees will be transferred directly to the bank accounts of pregnant women who undergo institutional delivery and vaccinate their children. This scheme will help reduce the maternal mortality rate, in a big way. This will help ensure nutrition before and after delivery, and improve the health of mother and child. So far, pregnant women in 53 districts were being given financial assistance of 4000 rupees, under a pilot project. We are initiating a scheme for senior citizens. Banks often reduce their deposit rates, when they receive a large volume of money. This should not adversely impact senior citizens. Under the scheme, senior citizens will receive a fixed interest rate of 8 per cent for a period of 10 years, on deposits upto 7.5 lakh rupees. The interest will be paid monthly. Political parties, political leaders and electoral funding, figure prominently in any debate on corruption and black money. The time has now come that all political leaders and parties respect the feelings of the nation’s honest citizens, and understand the anger of the people. It is true that from time to time, political parties have made constructive efforts to improve the system. I urge all parties and leaders to move away from a “holier than thou approach,” to come together in prioritising transparency, and take firm steps to free politics of black money and corruption. In our country, people ranging from the common man to the President, have at some point or another, advocated simultaneous conduct of state and national elections. This is to break the endless cycle of elections, reduce election expenditure, and minimize pressure on the administrative machinery. The time has come for this to be seriously considered and debated. Positive change has always found space in our country. We can now see a positive momentum towards digital transactions in India. More and more people are transacting digitally. Yesterday, Government has launched a new, swadeshi platform for digital transactions – named BHIM after Babasaheb Bhimrao Ambedkar. BHIM stands for Bharat Interface for Money. I call upon the youth, the trading community, and farmers to connect with BHIM as much as possible. Friends, the developments, decisions, and policies that were put in place after Diwali, will of course be evaluated by economists. It will be good if social scientists also do the same. As a nation, India’s villages, poor, farmers, youth, educated and uneducated men and women, have all displayed infinite patience and people power. In a short time, the new year of 2017 will begin. Exactly 100 years ago, in 1917, Mahatma Gandhi initiated a Satyagraha in Champaran. Now, a century later, we witness that the people of India continue to share that feeling towards truth and goodness. Today, Mahatma Gandhi is not among us. But the path towards truth that he showed us, is still most appropriate. As we begin the centenary year of the Satyagraha, let us recall the Mahatma and resolve to follow his message of truth and goodness. We cannot allow this fight against black money and corruption to stop or slow down. Firmness in truth is a guarantee for success. A country of 125 crore, with 65 per cent below the age of 35, having the means, the resources, and the capability, has no reason to stay behind. The new dawn of the New Year, comes with the resolve of new success. Let us all come together, to move ahead overcoming obstacles and constraints.